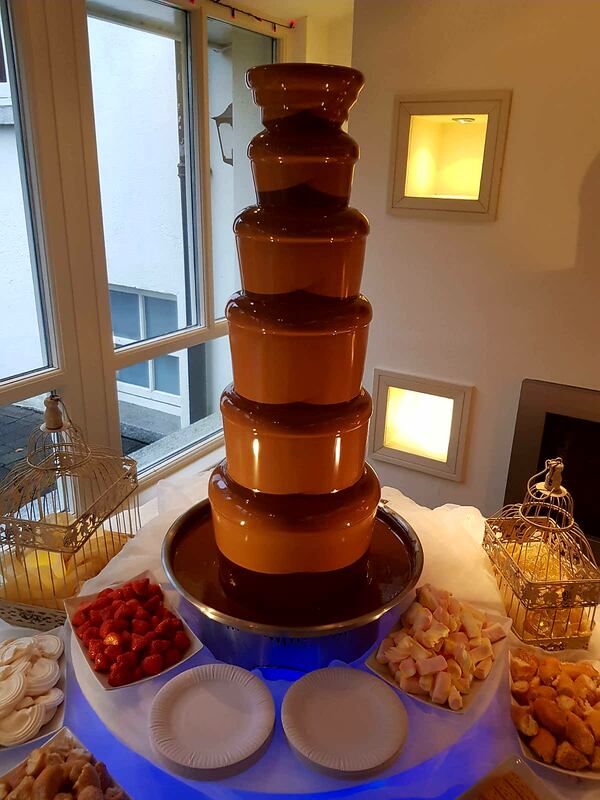 Chocolate Fountains or Chocolate Fondues at weddings and events are becoming more and more of a tradition. 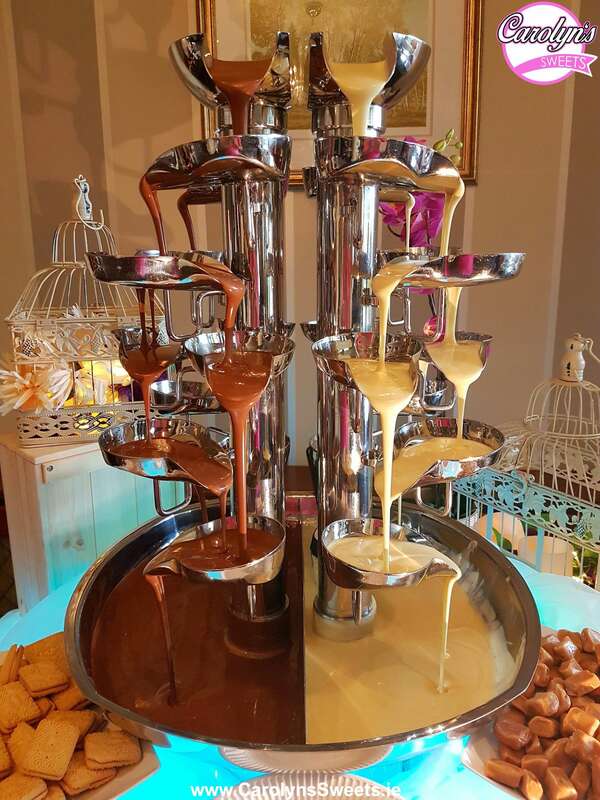 Imagine for a moment you have access to a cascading Chocolate Fountain of the finest quality, creamy smooth milk chocolate, as it gently flows down multiple tiers and coats your skewered assortment of fruits and naughty treats. 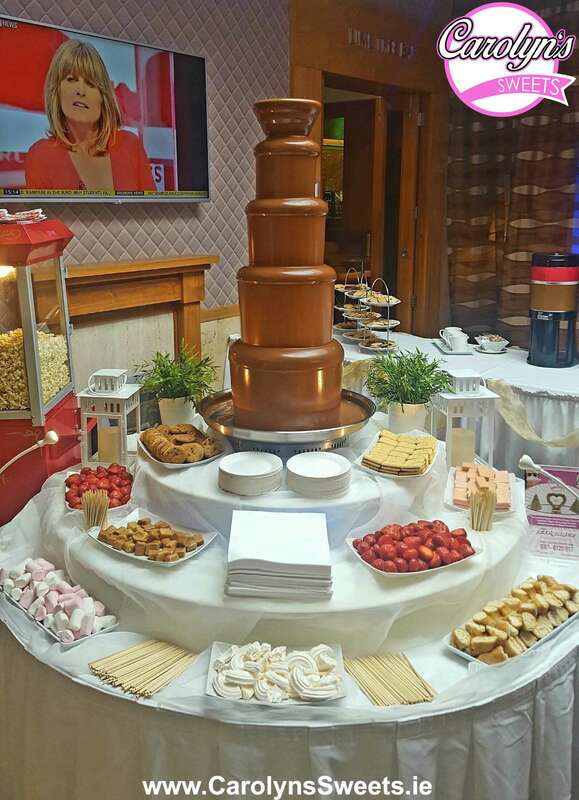 A Chocolate Fountain is fun for all your guests and they also create a special ambiance. It is a gathering piece to allow guests that do not know each other, interact and get talking. Is that not what your event is all about? Mixing family and friends? 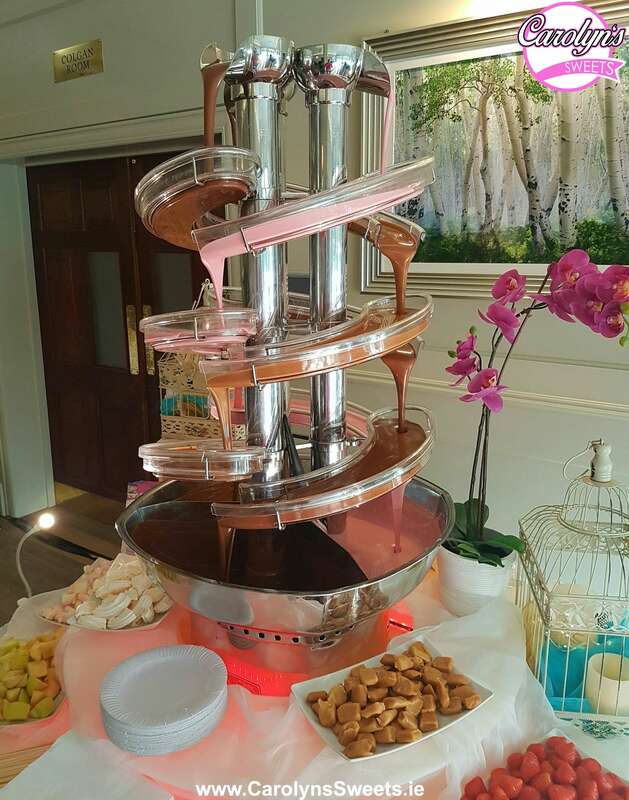 The Chocolate Fondue decadent aroma and dipping experience has always been enjoyed by all age groups. 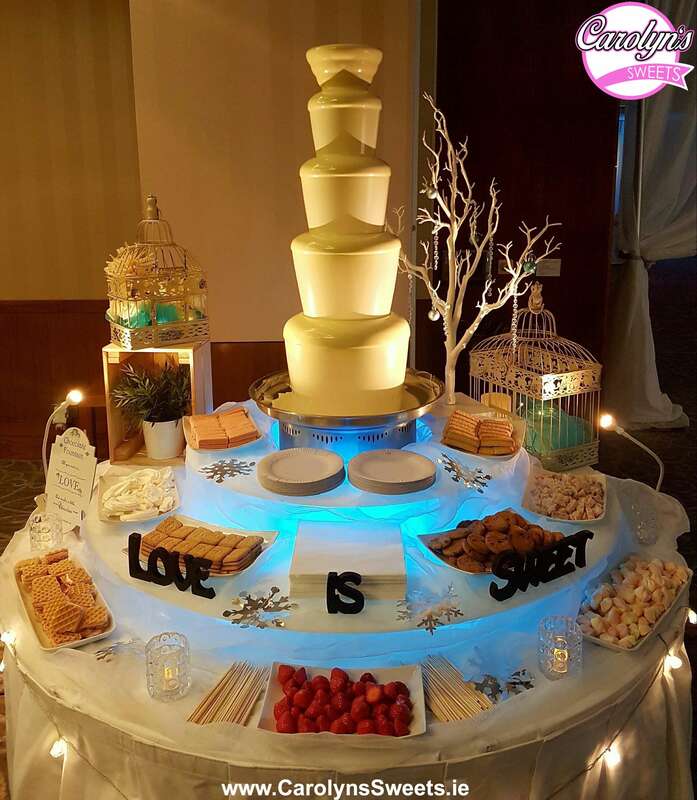 What you could do is even reduce the size of your wedding cake in conjunction with a Chocolate Fondue. 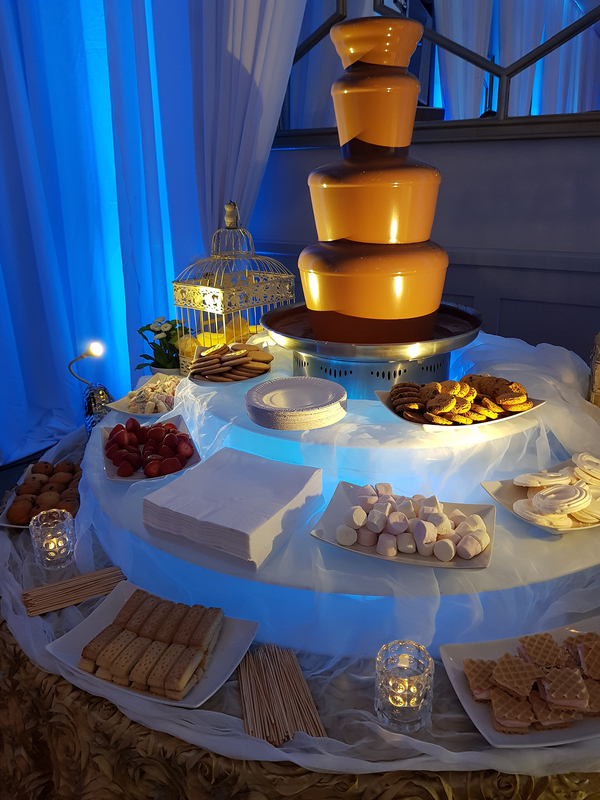 Chocolate Fountains come in a variety of sizes and styles and we always supply a uniformed staff member to ensure a carefree experience for you and your guests, keeping the dipping area attractive and maintaining the Chocolate Fountain for the entire duration of your rental period. 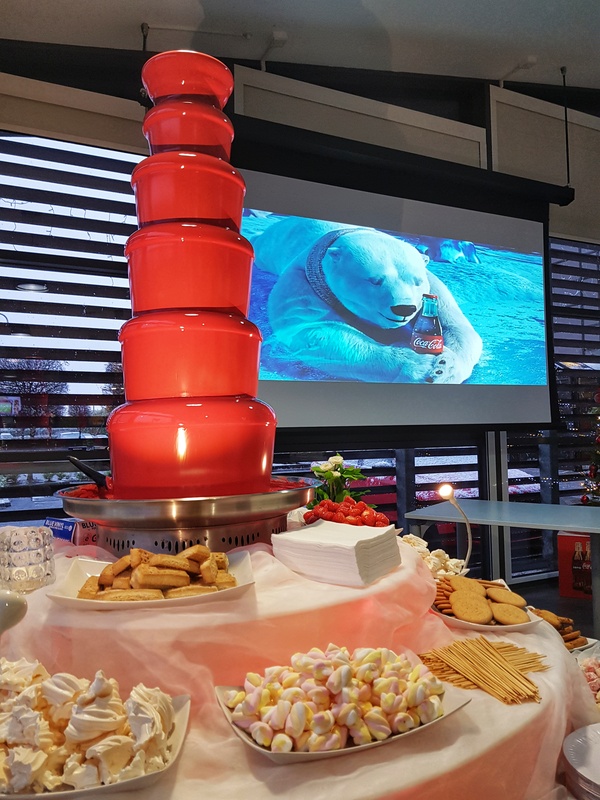 We only use the top of the range Chocolate Fountains available on the market and when combined with delicious Belgian chocolate you are for sure on your way to impressing your guests with our displays. 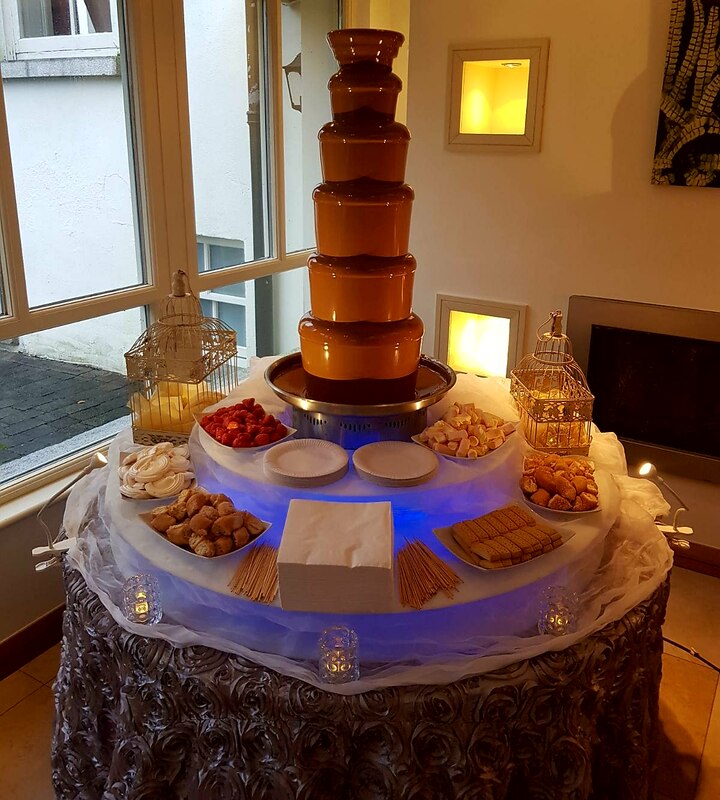 There is a Chocolate Fountain to suit all budgets from our 4 Tier Chocolate Fountain all the way up to our Triple Chocolate Fountain. 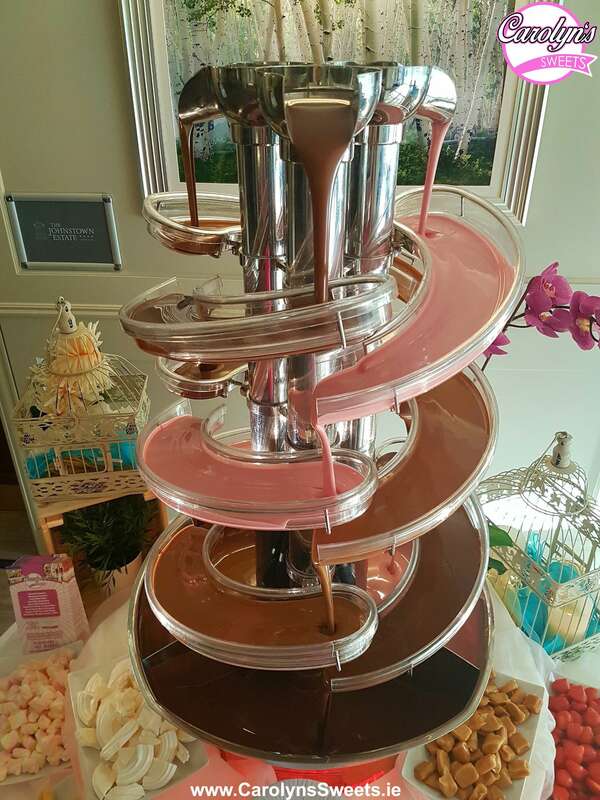 However, Choosing which Chocolate Fountain to use for your event is not an easy task. 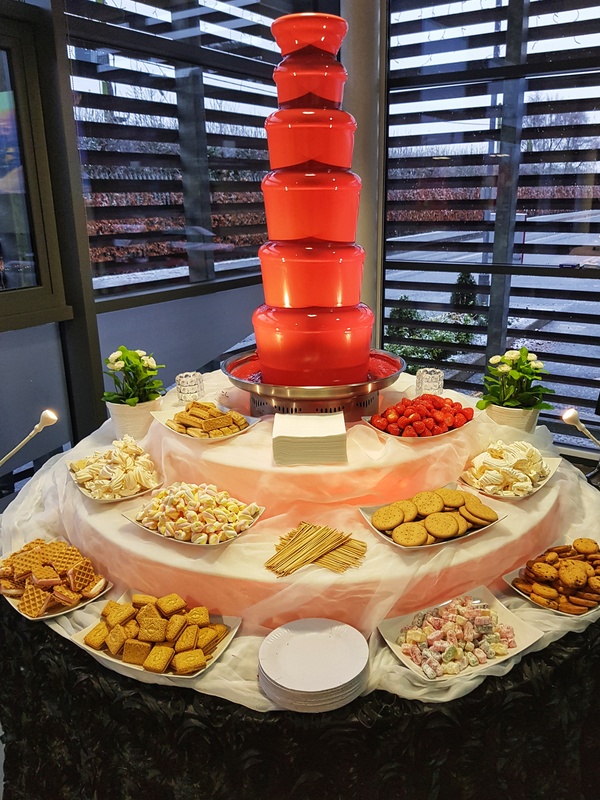 With a large range of dips for you to choose with the Chocolate Fountains your are able to choose up to 10 from the list below which is more then any other supplier in Ireland. 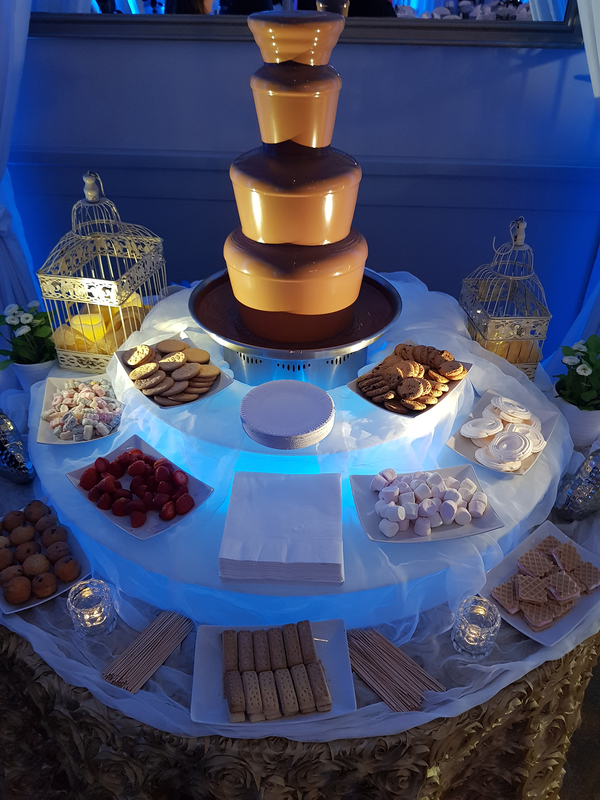 If you really want to stand out from the crowd why not choose between our choice of chocolates and have a bespoke experience for your Chocolate Fountain Hire. Milk, White, Dark, Cappucchino, Caramel, Honey, Lemon & Lime, Orange & Strawberry. We can also dye any white chocolate any colour you can imagine. 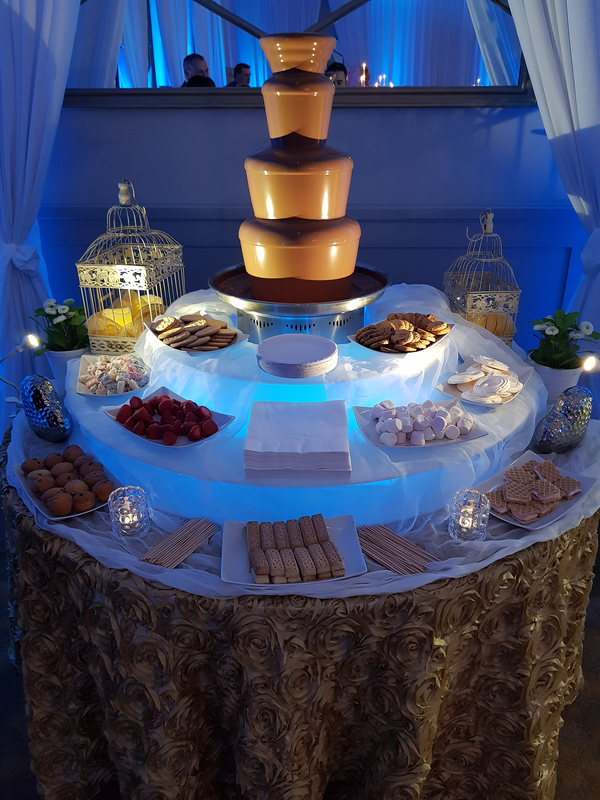 The smaller 4 Tier Chocolate Fountain is perfect for your event that is catering for 100 people or less. You can choose to have our Belgian Milk, White or Dark Chocolate, or why not stand out from the crowd and add one of our flavoured or coloured chocolates. You also get to have a choice of 6 different dipping items from the list above. 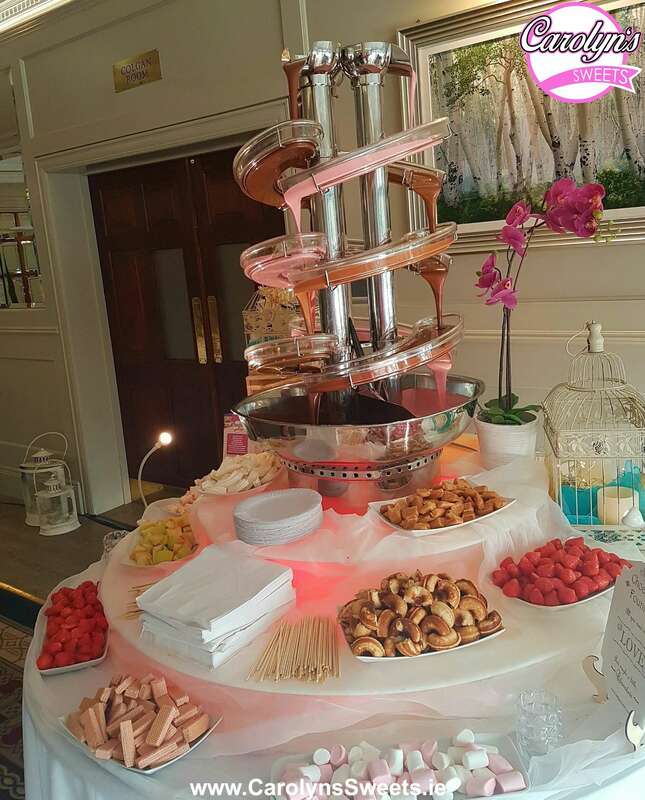 The most popular 5 Tier Chocolate Fountain is the perfect middle road fountain to which caters for up to 150 people. You can choose to have our Belgian Milk Chocolate, White Chocolate or Dark Chocolate. 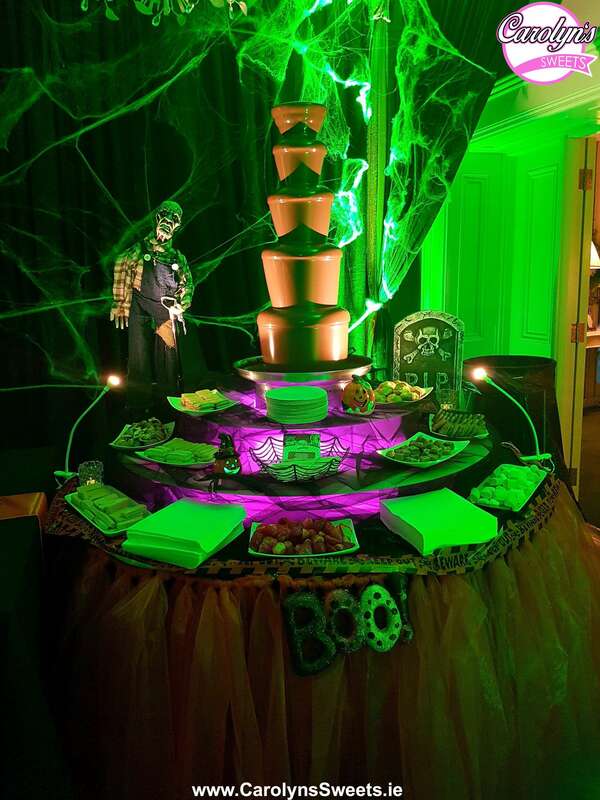 The largest 6 Tier Chocolate Fountain is very popular at all events catering for around the 200 people mark. You can choose to have our Belgian Milk Chocolate, White Chocolate or Dark Chocolate to suit all taste buds. 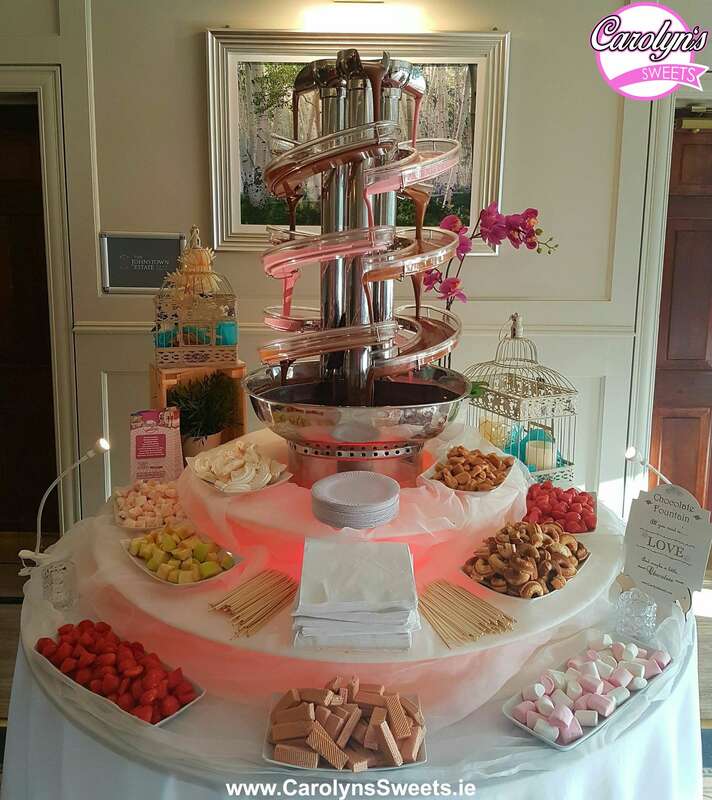 Carolyn’s Sweets was the first supplier in Ireland to introduce the Double Chocolate Fountain. You can run two types of Chocolate at the same time. Belgian Milk on one side then Belgian White on the other is the most popular combination. 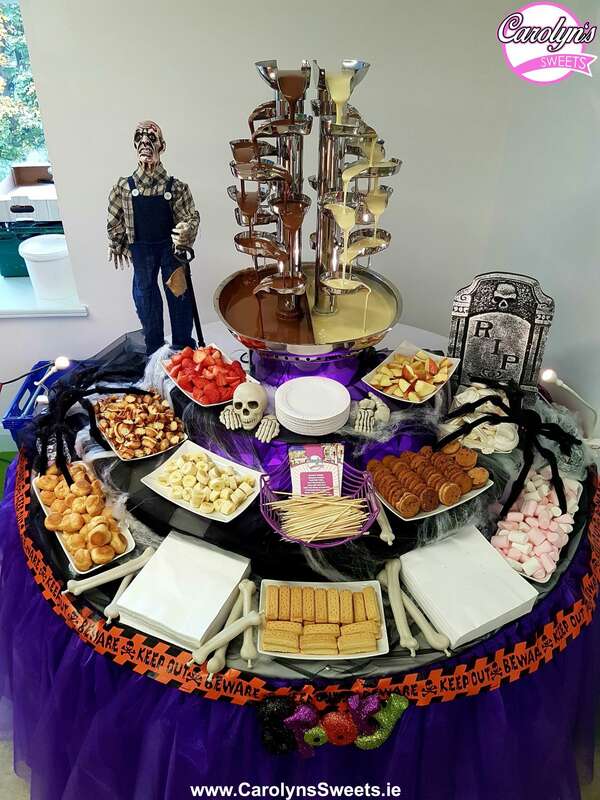 The Double Chocolate Fountain can cater for bigger events of over 200 people. 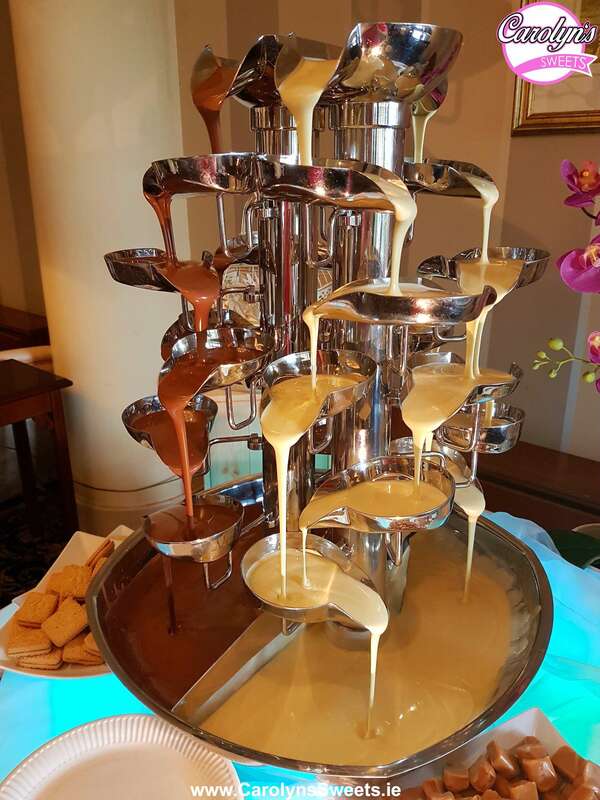 What is a Triple Chocolate Fountain? Straight from Dubai we brought this fountain to the market and it has been very popular and you will not have seen anything like this before. As a result your guests will be amazed. Belgian Milk, White & Dark Chocolate all cascade down the Chocolate Fountain slides at the same time. 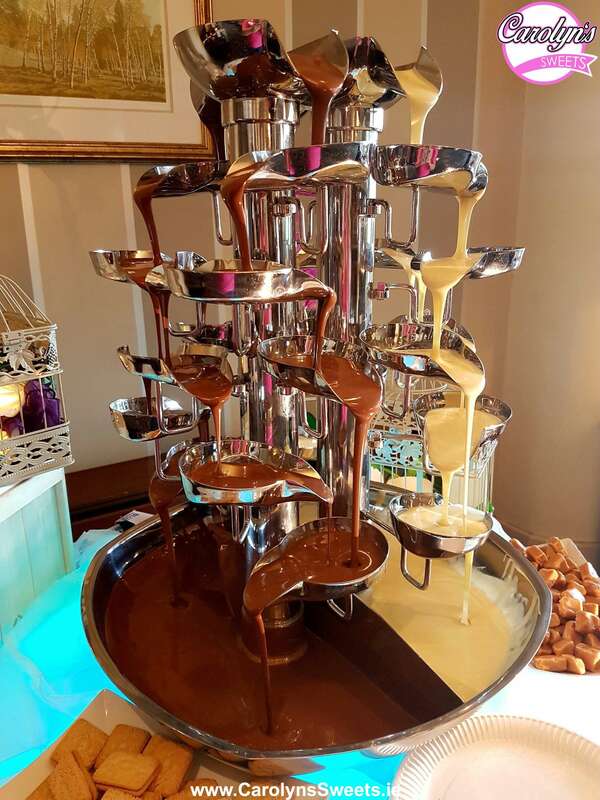 This is the biggest most impressive Chocolate Fountain you will have ever seen. If you have a large group of people and want to ensure everyone gets looked after then this is the fountain for you. Catering for over 250 people it is perfect for larger groups. 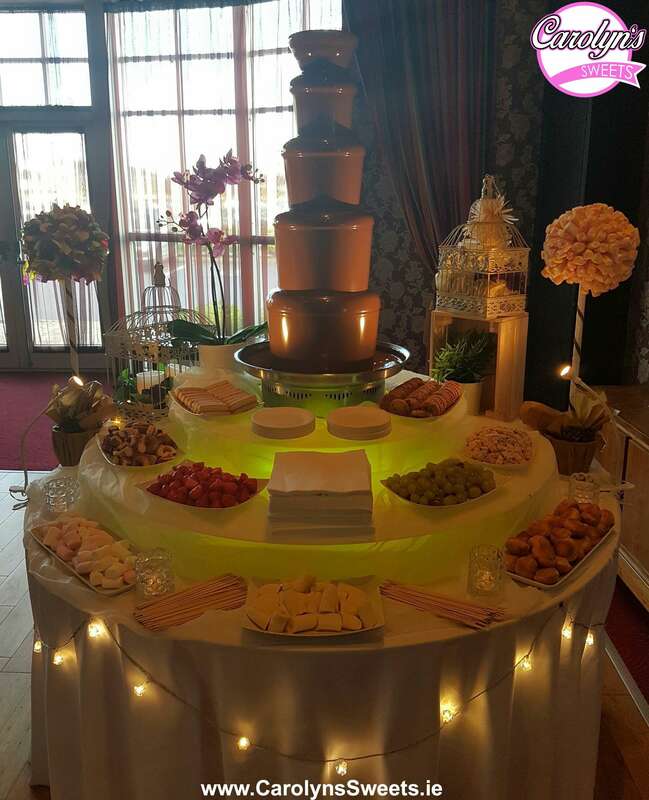 Get in touch with us now for more details on our Chocolate Fountains.